It is no secret that Atlantis Toronto weddings are among my favourites in the GTA. This beautiful wedding venue located on the shores of Ontario Lake offers a photographer the perfect backdrops for wedding pictures. 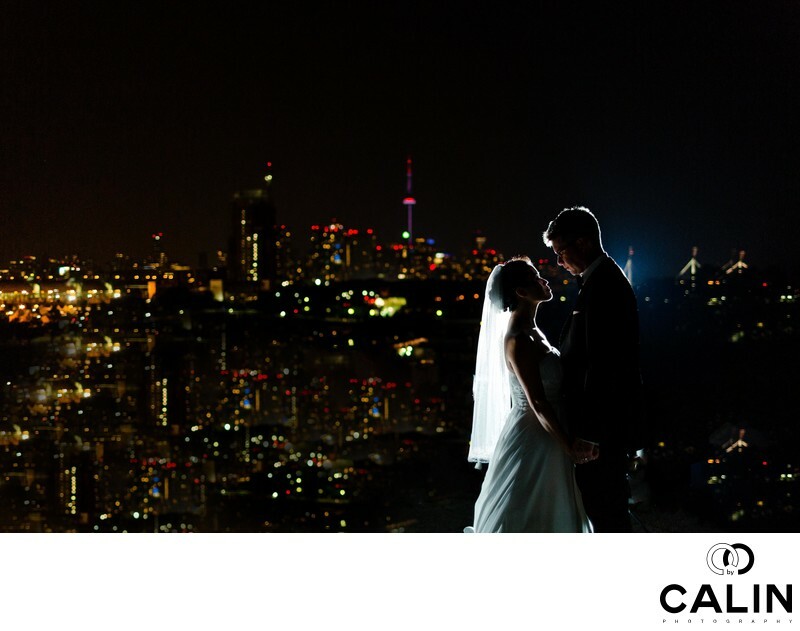 For this shot, during the wedding reception, I asked the bride and groom to join me for quick photo shoot on the rooftop of Atlantis Toronto. On this beautiful July day, the Toronto skyline was creating a dreamlike background. As usually, there were three bridal parties waiting to take pictures in that particular spot so I had to act quickly. As such, the placed a flash behind the bride and groom, measured the light and took a few frames. From composition standpoint this is an asymmetrical image, perfectly balanced though. The bride and groom are placed on the right hand side of the frame and artificially balanced by a group of skyscrapers on the left-hand side of the image. A few banisters create leading lines towards the newlywed couple. Even more, the banisters are parallel to the baroque diagonal, which creates dynamism and this night portrait. Despite the fact this is a beautiful night portrait, there are a few things I wish I do differently. First, the pose can be improved in this image. The bride and groom were holding hands standing next to each other. Call me a perfectionist but to me this looks a bit unnatural. Second, the flash place behind the groom is illuminating in the bride and her veil beautifully. Still, the backlight cast by the flash does not match the orange tungsten city lights.